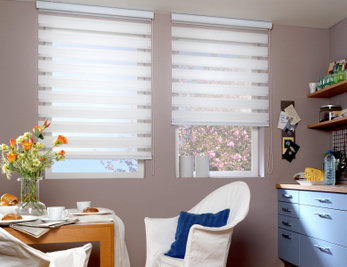 This style of blind is called various names by different manufacturers: Vision blinds, Night & Day blinds, Duorol, Zebra blinds. 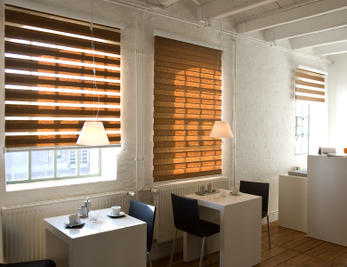 The innovative design of this type of blind combines the elegance of a sheer blind with the privacy of a roller blind by shifting the fabric strips to the desired effect, thus allowing as much or as little light as required. 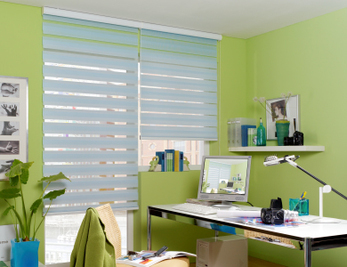 This product is available in a range of colours and finishes including metallic, tri-colour and wood effect. Blackout is also now available - ideal for bedrooms! Options include an open or closed cassette to conceal the mechanism neatly. 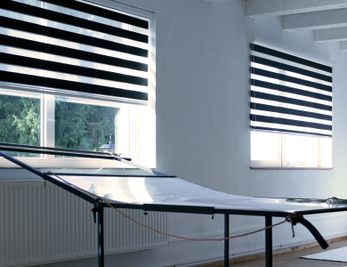 The headrails can also be personalised to match or contrast with the fabric. You can even link these to your Somfy Connexoon or TaHoma smart home systems and operate them at the via an app on your smartphone!